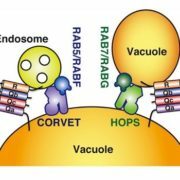 During seed development, protein reserves and minerals are stored in specialized vacuoles called protein storage vacuoles (PSVs). 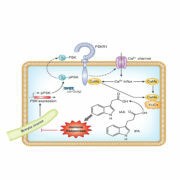 PSVs are functionally different from the lytic vacuoles (LVs) that serve a lysosome-like role in vegetative plant tissues. Embryonic vacuole (EVs) are also present during early embryogenesis. 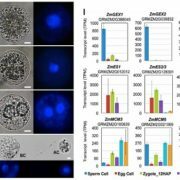 Later, during the maturation phase of seed development, PSVs arise to accumulate storage reserves and ultimately become the only detectable vacuole. 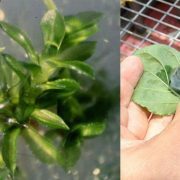 PSVs persist in embryonic cells until seed germination, when reserves are mobilized to provide nutrients for the growing seedling. 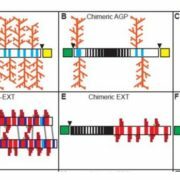 Controversy exists as to whether PSVs arise de novo during seed development or originate from pre-existing EVs. Feeney et al. 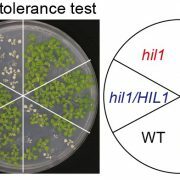 (10.1104/pp.18.00010) have tested these two hypotheses by studying PSV formation in Arabidopsis (Arabidopsis thaliana) embryos at different stages of seed maturation as well as in Arabidopsis leaves reprogrammed to an embryogenic fate by the induced expression of the LEAFY COTYLEDON2 transcription factor, a master regulator of seed maturation. 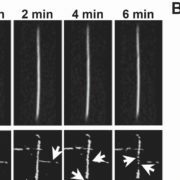 The authors produced transgenic Arabidopsis lines expressing fluorescent protein-tagged markers for the tonoplast and the lumen of PSV as well as tonoplast markers for preexisting vacuoles (LVs in leaves; EVs in seeds). In addition, they visualized PSVs using both fluorescent pH-sensitive stains and inherent PSV autofluorescence. 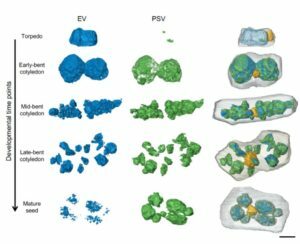 Confocal and immunoelectron microscopy indicated that both storage proteins and tonoplast proteins typical of PSVs were delivered to the preexisting EVs or to the LVs in reprogrammed leaf cells. 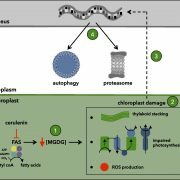 These results indicate that Arabidopsis PSVs arise by the remodeling of preexisting vacuoles rather than by the de novo biogenesis of PSVs.